When I arrived Matti was already dialled in with banners set up, PA ready, just the floor to clean again, and judging sheets to organise which I was one of my jobs to do. I’m still injured so I watched as Matti, TGM Maz and Chris Brook enjoyed an empty floor. Mario wanted to arrive early and get used to the fast floor, and even learnt a nice new line, flail boomerang to hang 5, looking forward to seeing how he develops that move. in the future. Chris coasted no footed manuals across the floor with ease and Matti who was suffering with a bad back was working on steamrollers. The organisers of the Cycle Show put us up in an amazing hotel, that fatally had a Carhartt outlet store right outside. £85 jeans for £40, you know what happened…. Saturday soon came around, after updating FM first thing I made the short trip down from the hotel to the NEC for the first day of competition, Saturday was all about the AM’s. Upon arrival it was great to already see a crowd two to three people deep all the way round the barriers and awesome to see the Am’s already keen to bust out. The contest format is simple, two runs and your best run counts. Soon after the start, in which myself and Matti Hemmings shared mic duties the PA shut down completely. 10 riders in the Am class, really stoked to see old school head James Ovens in the mix, he even repped the OG “flatmatters” tee on the sunday, during his run he hit squeaker to backwards wheelie bar flip, slow and controlled one handed fork wheelies and ended up in tenth place. 9th place went to a hungover Michał Pietruszewski, Michal hit a nice brakeless pedal 5 to bar flip, but one to many crashes kept him down low down in the rankings. Great to still see him smiling the whole time nevertheless, rad dude! Remus Simion out of Spain now living in London took the 8th place spot hitting his shove it steamroller, cliff-hanger to hitchhiker, and gerator to two footed backyard pivot out. His clothing and shoe colour coorindation was on point for sure this weekend. Really stoked to see Matthew Dyer in the mix, and Denny hit one of the best lines of the contest, half vertical quick change to freak squeak! Matti gleamed with welsh pride, 45 years old and still going strong! Hell yeah Denny! In 6th place and somewhat of a surprise, Dino Jeffers had a rare off day. Anyone who has ever seen Dino knows how dialled he is, so it definitely was a surprise to him struggle to hit his lines. We asked him if he would be down to ride Pro on the Sunday and he was so all was not lost. We are getting into top 5, and fifth place was all about TGM Maz! 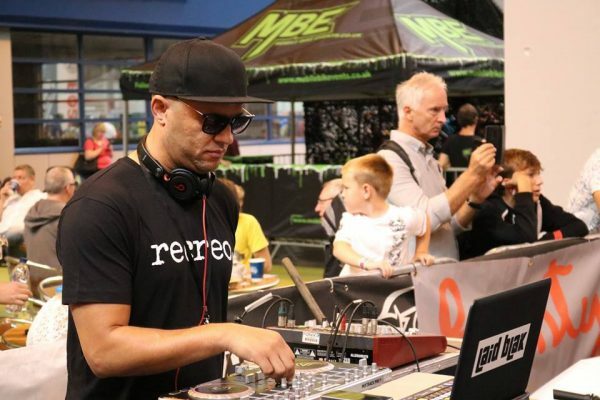 One of the funniest moments of the weekend was when Mario released Matti had arranged with the DJ to play the “Mario” game tune, Maz’s face was a picture! Maz hit his steamroller to carved hitchhiker, mega spin to flail boomerang, fire hydrant to decade, and just missed his fire hydrant to double decade, that both he and Denny were trying desperately to hit! 4th place went to the man I dubbed “Mr Rolaid”, and boy did Stu McLaren live up to his new nickname hitting a lovely brakeless rolaid off the frame, hitchhikers, whiplash to rolaid. Great to see Stu still out their killing it, and perhaps the best tattoo in flatland! Hometown boy, Johann Chan first run was one of the best runs I have see him ever do for a well earned third place podium finish. 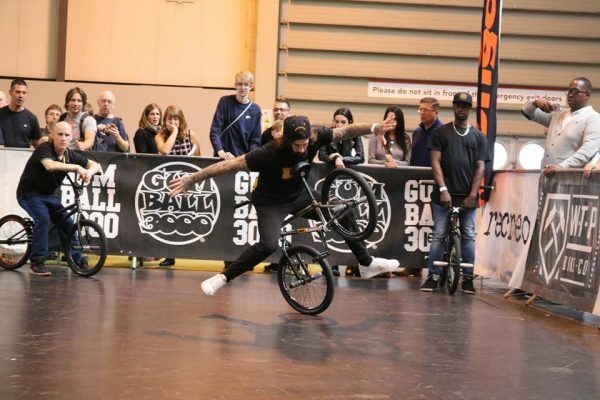 Hitting his bars backwards hang nothing to cliff, mega spin to backwards spinning lawn on the opposite side to regular spinning lawn bar flip out, and even a lil’ surprise thrown in, Johann hit a really smooth no handed one footed hang 5 across the NEC floor! Great stuff! 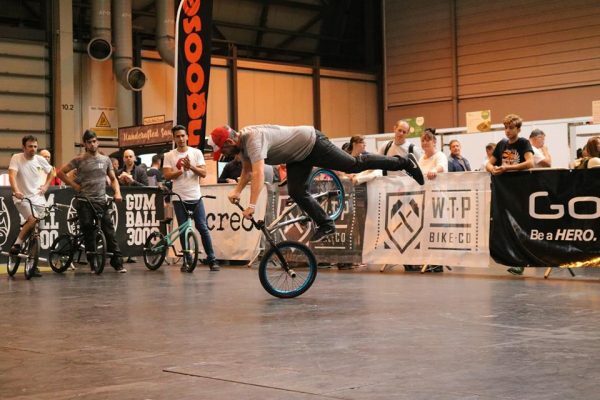 So good to see Lee Wilson back on the contest scene, smooth brakeless style for days, hitch around the worlds clean, hitch jugglers to crack steam around the world exit out, Lee finished second and was only beaten by last years winner Aran Gillan who has a really powerful style! Opposite xft pedal 5 carved across the whole floor, superman peg grab steamroller to no handed crack steam e squeak exit, time machines, rocket fives, nose manuals, Aran really is a great talent! Congratulations once again to Aran taking the AM flat title for the second year in a row! 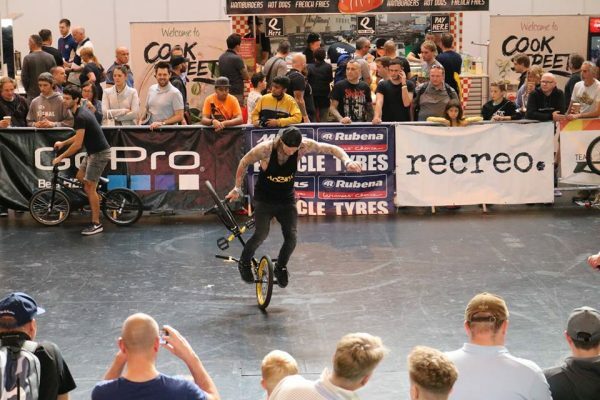 We invited the top 3 to compete in the pro class to gain some experience and help push their riding, a big part of the UK flatland Championships philosophy. The level was up from last year, so that was great to see! 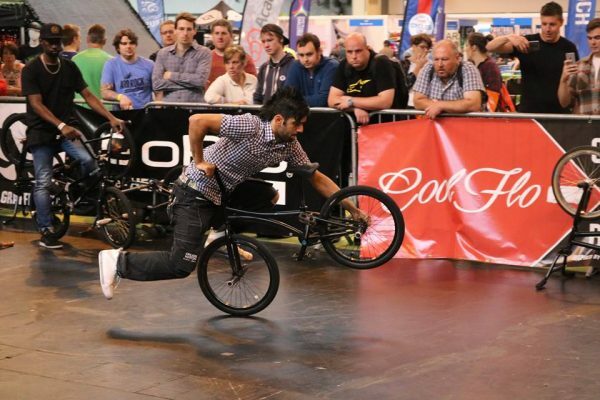 Great day at the Cycle Show. 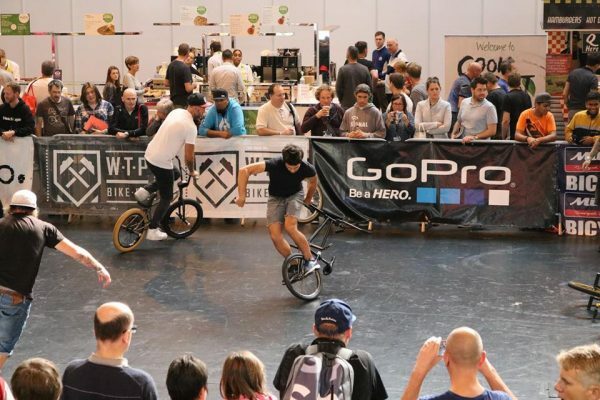 Sunday morning was all about final tweaks, sorting prizes, it was great to see to arrive at the contest arena and see it busy with riders and a big crowd developing. 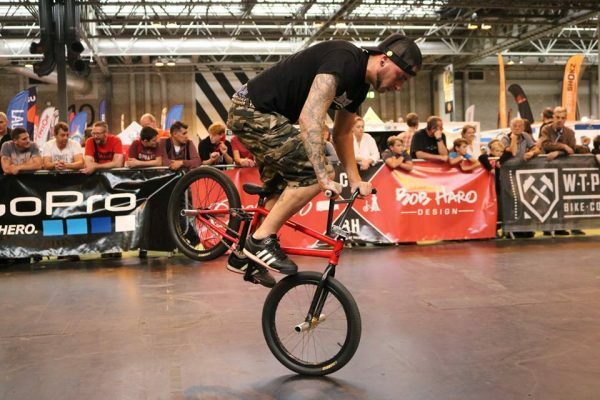 This definitely had the feel of the biggest flatland comp in the UK for many years, lot of memories came flooding back watching the riders warm up. If you paid attention to social media before the event you will have seen Matti announcing we had a special guest, last year it was Martti Kuoppa, this year it was Sam Foakes! 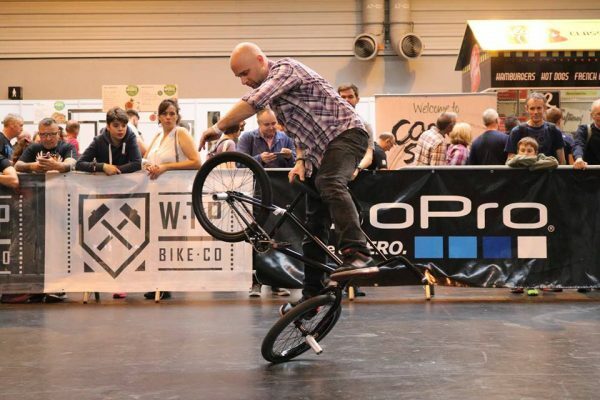 This year, Sam was invited to help judge the event, and was great to see the shock on riders faces as he arrived in the contest area. The pro class was 16 riders deep, so we split the groups in two, and run the two runs for the first group before moving onto the second group. A few of the AM’s were jamming in practise, so we invited them to enter the pro class along with the AM top 3. The crowd were hyped, at least 5-6 people deep when we started. 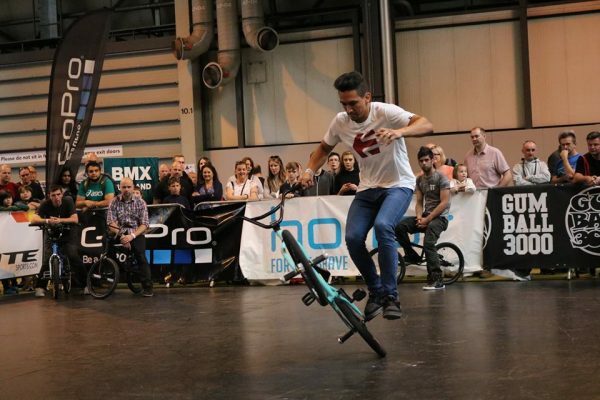 Amazing energy in the NEC, Remus Simion was one of those riders invited to step up and give the pro class a go and the man from spain rode better than he did on saturday, and we hope his experience entering the pro class will be good for his riding level. 16th place for the Spainiard. Bence Pozsonyi hit his two footed no handed tea kettle bar flip out to take the 15th spot, a few too touches kept Bence out of the top ten on this occasion. Contest veteran, Dino Jeffers proudly wore his factory jersey (see the photo) and also like Remus rode better than yesterday hitting his inside rolling xft ice cream to shove it gerator body varial out! Yes Dino! Amos Burke rode the best I have seen him ride in a contest in a long time, hitting a sweet rolaid (something about the roliad this weekend! ), 13th place for Amos! 12th place went to TGM’s Jason Forde, who had a tough time out on the contest floor, but did hit a nice no handed hook spin to time machine. I’m looking forward to the day when Jay shows his level at a contest. I feel like it’s coming. 11th place went to Johann Chan, who stepped up and rode like he belonged in the pro class! Two solid runs, hitting with his signature mega spin to backwards opposite foot spinning lawn to regular lawn bar flip out, hitch to spinning ck, bars backwards hang nothings across the floor to cliff, great weekend for Johann! Top 10…. TGM local Steve Green hit a nice whiplash to messiah turbine whiplash out, mega spin to foot jam decades, and whoppers to take the tenth place spot. Miguel Pargas just became a UK citizen and rode the UK Champs with cracked forks, his forks were ready to snap all weekend but thankfully they didn’t. Miguel rides back wheel, super smooth style, multiple gerator body varials on lock, inside no handed switch b’s across the contest arena, and a ninth place finish for his efforts. Look forward to seeing a lot more of Miguel in the future. 8th place went to Josh Briars who had a bit of bad luck in his first run with the PA cutting out once again, and seemed understandably to knock Josh out of his usual rhythm. Aran Gillan from Belfast carried on where he left off on the Saturday and stepped up a few of his combos for the pro class, hitting a smooth superman peg grab steam to no handed crack steam e squeak out, great to see Aran step up and do so well! 7th place is not too shabby at all! 6th place went to Lee Musselwhite who’s started his run with his signature spider glide move , but couldn’t continue at the same level and missed his no footed backyard line, but did hit a nice boomerang to halfpacker to phoenix in his second run. Lee’s originality was enough to land him a sixth place finish. Phil Dolan returned with game face in full effect and hit an amazing multiple whiplash to brakeless pinky squeak line, multiple backwards whiplashes to backwards xft pedal 5 front scuff forwards pedal 5 out. 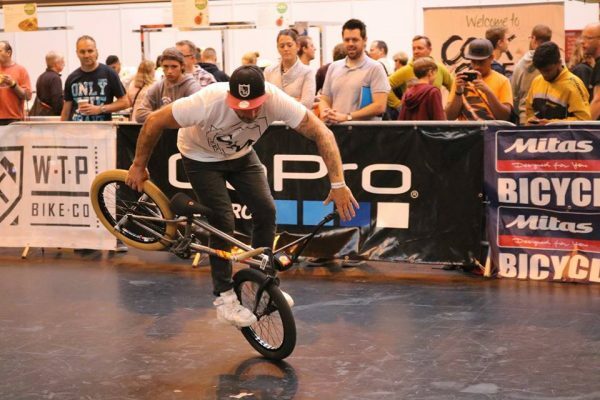 So good to see Phil back on the contest scene, what he did pull was on a level with all the top riders in attendance. Matti may have said Phil was 46 over 46 times hahaha. Every dog has his day as they say, and Andy Hale had the best runs I have seen him do, hitting his 540 pivot bike varial to two footed dump truck pivot, multiple two footed backyard pivots, and even threw in a few multiple whiplashes for good measure. Stoked for Andy! Top 3 was a battle! Once again Dominik Nekolny was a machine in more ways than the obvious, flying in on the day of the contest all the way from Prague. It really is great we have support from international riders flying in, Dom messed up his first run a lot. But Dom got things together on the second run hitting everything until Matti said on the mic “flawless run so far” then had some trouble on his xft nose jump to crack line, it is amazing to see Dom now adding the xft hitch pivot backwards backpacker pivot xft hitch to xft juggler in his runs now. Much like Phil, James White had game face on! Starting his run with 6 whiplashes, xft spinning lawn to gliding gerator to his signature smith drop decade exit out, multiple downside hitch jugglers whiplash out with absolutely beautiful execution, another whiteski OG move the multiple ice cream switch foot dump glides, and the banger everyone was surprised about, James dropped the “Zinger” his signature bike flip bunny hop. 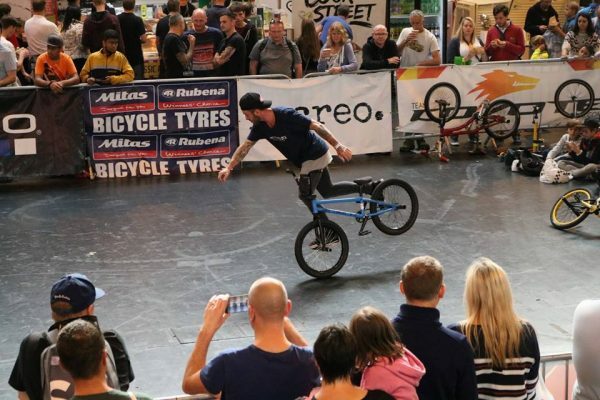 It was great to see James pushing his riding in a contest format, this time not a scuff in sight. Judging sometimes is a tight call, and James second over Dom was super tight but we all felt the bike flip just edged it. The undisputed winner this weekend, Alex Jumelin! Even though the format was best run counts. Truthfully Alex could have won with either run, really amazing to see after all these years Alex is riding better than ever. I have seen Alex ride a lot and I think in terms of contest riding, this was the best I have seen him ride. 720 manual nailed, Rocket plastic man hop backwards turbine forwards rocket plastic man to xft inside steam jump pedals backwards stem boomerang out, downside whiplash kick rewind regular whiplash out, nose manual jump xft steam mid combo, and so much more! Alex is on a record too right now of 9 contests in 9 weekends back to back, travelling all over the world! 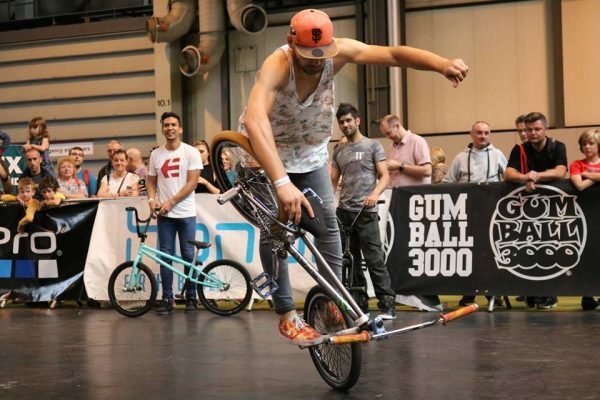 Congratulations once again to Alex, the 2016 UK Flatland Championships. The event was a success this year, more riders, bigger crowd. 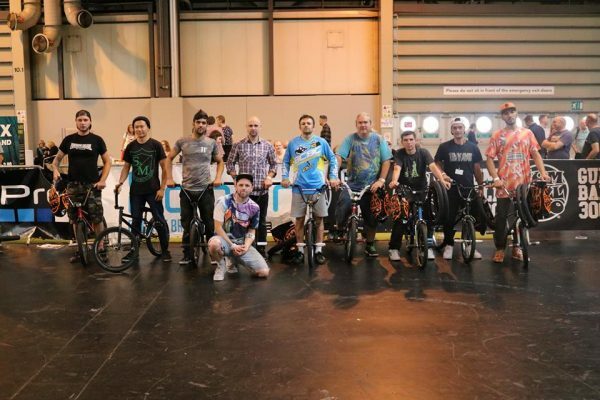 Big thanks to everyone who helped make this a great weekend for the UK flatland scene, Alex and Dom travelling over, the Recreo DJ’s, the Judges, all the riders and sponsors, Mark Noble, the Cycle show organisers, and of course Matti for inviting me to help organise the event. 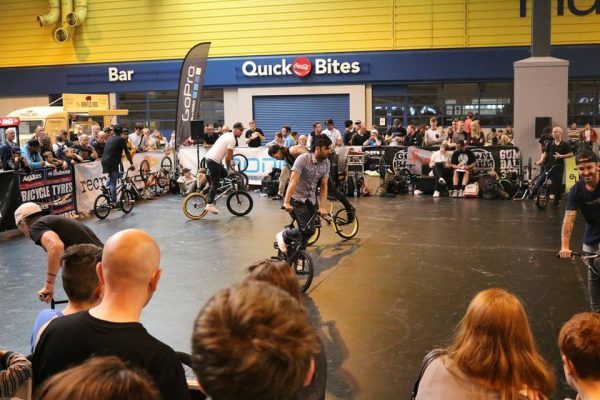 Stay tuned for 2017, we have a lot more planned for the UK flatland scene.